Read just about any bourbon review and the word vanilla is damn near certain to appear. Much like some of the crazy wine descriptions you see or hear from the “experts”, sometimes I take these flowery descriptors with a grain of Mediterranean Sea with a touch of dandelion pollen salt. But not vanilla. You see, the reason bourbons are so rich and sweet with that familiar flavor is rooted in science. And I like science. I’ve written about the barrels used for bourbon aging before, but as a quick refresher, one of the legal standards that make a bourbon a bourbon, is the use of brand new, charred American oak. These two factors become clearly important when you taste a bourbon or two. The fact that these barrels are previously unused, mean the aging/extraction is consistent and reproducible. Using used barrels makes for some interesting flavor nuance as the previously aged liquor still remains to some extent captured within the wood, but for bourbon this would not be ideal. 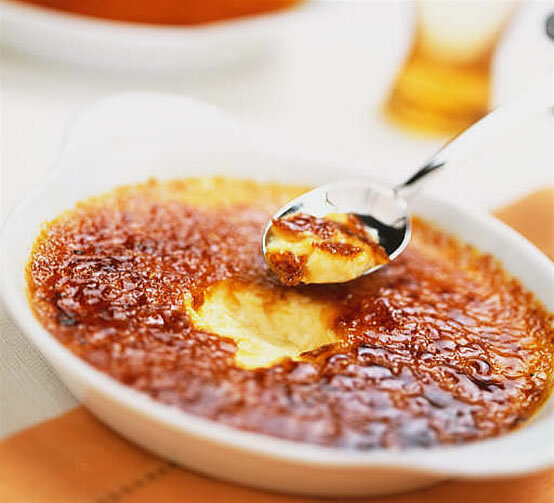 For the second component, picture a delicious creme brulee. Custard topped with sugar and torched to a glass-like texture caramelizes those sugars bringing out those deep and delicious flavors. Wood, particularly oak, believe it or not, is also made up of sugars and sugar like components. Once charred, those sugars “caramelize” into the molecular components fit for alcohol extraction. One of the most common molecules found from the charring process is vanillin. Yes, the same molecular structure that makes up a major portion of the vanilla bean. And just like with our bourbon, alcohol is used to extract that flavor for your favorite vanilla extract; vanillin and its similar flavor components are greatly soluble in alcohol. Anyone else getting as jacked up about this as I am? And for the bonus round: You know that “imitation vanilla extract” sold for half the price? While vanilla beans are indeed made up of a good portion vanillin, there are other components that help create the overall vanilla flavor profile. This is why bean to bean, area to area, pure vanilla can be really unique. Most of that imitation stuff on the other hand, is pure vanillin, sometimes derived synthetically. If you’ve ever used the stuff, you know it as dull and distinctly artificial tasting. So next time you are in a pinch, don’t reach for the imitation stuff, grab your bourbon, pour some for you and your cake batter. What is the best way to “char” the bourbon and how hot? No need to burn off the alcohol. Vanilla extract is actually mostly alcohol (just like bourbon). It isn’t a perfect substitute but it adds a bunch of flavor!